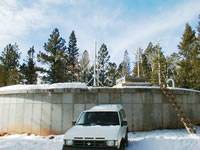 The Duck Creek system consists of 7 monitoring sites: 2 tanks, 2 chlorination buildings, a pump station, a booster pump, and a vault with a PRV valve. The system controls pump on/off status and measures pressure, flow rate, and current (at the pumps). Alarms are set for low water levels, pump failures, loss of communications, or intrusion incidents. A voice-synthesized modem provides data and alarm messaging by phone. The project uses CR10X and CR205 dataloggers, as well as RF400 spread-spectrum radios (900 Mhz, frequency hopping).